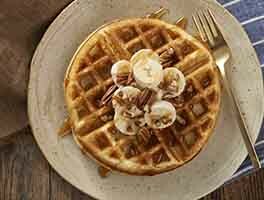 These golden brown waffles, with their comforting, mildly nutty flavor, are crispy on the outside and tender within. 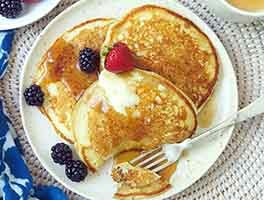 Add fresh berries or a drizzle of syrup for a sit-down feast, or enjoy plain as an on-the-go breakfast. Prepare and preheat a waffle iron according to the manufacturer’s directions. In a small bowl, whisk together the flour, cream of tartar, baking soda, and salt. Place the whites of the 2 eggs into a medium-sized bowl. Whisk or beat them into soft peaks. In a separate bowl, whisk together the yolks, water, oil, and honey. Whisk the flour mixture into the yolk mixture. 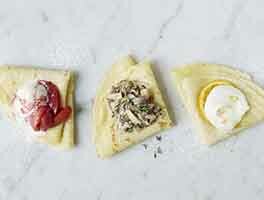 Using a spatula, gently but thoroughly fold the whisked egg whites into the yolk mixture, one-third at a time. 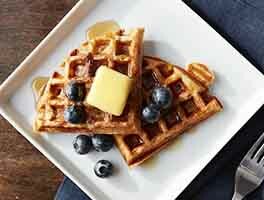 Use a generous 1/4 cup batter for each waffle. Cook until the waffle iron has almost stopped producing steam. 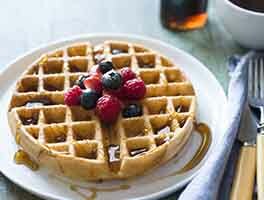 Serve waffles hot, one by one; or keep cooked waffles warm in a 200°F oven while you cook the entire batch. Freeze waffles for up to 1 month.